Are you able to love the world without having the love OF the world? Are you personally concerned for the multiple hapless millions lost without hope in this God-rejecting age? ON-THE-SPOT WORLD TOMORROW radio broadcasts have been beamed to you from India, Israel, Vietnam and Japan. Other eyewitness reports have been compiled for you from dozens of additional nations and published in Plain Truth magazine. These broadcasts and reports have provided you with the most up-to-date information about world conditions. You have become familiar with the innermost thoughts, wishes, dreams and desires — the everyday problems — of the many peoples who share your world with you. Vastly different modes of life have been revealed to you. You have heard about the lives of average citizens the world over — how they work, live and die. Each nation has been different. Each has its own particular problems —compounding the already wearisome needs of survival which all peoples have in common. Yet, in spite of nationality or locality, in spite of the fears, disappointments and tragedies so characteristic of "modern" existence, every inhabitant of our troubled planet wails out in a unified chorus of emotion: "I WANT TO LIVE, I LOVE LIFE — HELP ME." These people, sandwiched together on this minute orb, lovingly called "the Good Earth," usually don't agree with the politics of the nations around them — and in many cases they don't agree with the politics of their own nation. Their physical circumstances are all too often in desperate need of improvement. Their only wish is for a better life. But no matter what the situation, THEY DOGGEDLY CLING TO THIS LIFE! It's all they've got. It's the same the world over. People realize that life, as they know it, doesn't have all the answers. But — sorry — politicians offer no alternative. So most humans vaguely feel that their own personal existence must mean more than the confusion, trouble and strife which surrounds and envelops them. They know they need something more out of life than they're presently getting. But what? Man simply doesn't know; and tragically, he doesn't even care to find out. He stubbornly refuses to acknowledge what he really needs -GOD'S KINGDOM HERE ON EARTH! Recently I had the privilege of traveling through several nations of our sin-encrusted world. All were filled with dirt, disease, danger and death. And the cause of it all? MISEDUCATION. India is probably the epitome of human misery. Why? Miseducation is her foremost natural resource. I have seen pictures, read books and talked to people about India. All have tried to describe her poverty-stricken masses. But neither pictures nor books nor talk can make you experience the sights, sounds, and smells of India. Depravity and poverty are everywhere. The air is thick with the dank, musty, damp odors which clearly bear the stench of human wastes. You feel it here. Bony-eyed twigs — they should have been children — sit motionless in cow dung. That gets to you. The children. Not a chance in a million. If they ever get into their teens, it'll be luck — if they ever get out, it'll be a miracle. Babies purposely maimed to be better beggars. This is their one life. Never a decent meal — most dogs eat better. Home is the gutter; rain is their roof. And they'll never know any different. You feel them in the pit of your stomach. You feel guilty getting into a warm, clean bed. You feel rotten for having eaten dinner. Those helpless children out there are real! Of course I realize that conditions like this are not limited to India. Ghettos and slums are filled with poverty and dirt; whether they be in the United States or in some less blessed nation. But being in India, thousands of miles away from home, away from the familiar surroundings and sights, helped me see far greater depth of meaning in Jesus Christ's simple words, "Thy Kingdom come." In reading the account of how Jesus taught His disciples to pray, we often read His words without thinking at all (see Matt. 6:9-10). There's an enormous message here. There's a desperate urgency conveyed in this passage. Notice that "Thy Kingdom come," following immediately after hallowing God's name, is the very first request which Christ commanded us to make! Significant? What do you think? Jesus Christ, the Creator of the universe and Savior of all mankind, KNEW WHAT HE WAS TALKING ABOUT! He knew what man needed. Who else could know better? Christ had formed man from dust (Gen. 2:7). He wept for man (John 11:35) and He wept for the world (Luke 19:41). But He was going to do more than feel sorry. He was qualifying to change the world. He meant it when He told His disciples — OF ALL AGES — to pray for God's Kingdom to come. Jesus Christ knew man couldn't solve his multitudinous problems of living without help. He knew it would take the very Government of God to erase the heartaches of man. So He gave His life to make it all possible. Humanity is finally going to have all its ills cured. And Jesus Christ is going to be in charge. BUT MAN DOESN'T WANT IT GOD'S WAY! Thank God man's likes and dislikes won't make one whit of difference. "There is a way that seems right to a man, but the end thereof are the ways of death" (Prov. 16:25). Carnal minds don't believe that scripture. But world leaders have been echoing strange pronouncements in recent years. They now readily admit that suddenly, in the middle decades of the 20th century, it is now possible to completely wipe all life from the face of the earth. Cosmocide — the suicide of mankind — is possible by at least FIVE DIFFERENT means! Mankind is shocked by the specter of imminent, instant disintegration. But a true Christian — one who believes every word written in the Bible — should not even be surprised. Jesus knew man would come to the place of self-extermination when He foretold just such an eventuality more than 1900 years ago. And Jesus told His disciples — just as He is now telling us. Why? Because they were His friends (John 15:15) — and so are we! Your Bible has borne witness to this pivotal prophecy all these centuries: "Pray that you may not have to fly in the winter or on the Sabbath, for there will be sore misery then, such as has never been, from the beginning of the world till now — no and never shall be. Had not those days been cut short, NOT A SOUL WOULD BE SAVED ALIVE; however, for the sake of the elect those days will be cut short" (Matt. 24:20-22, Moffatt translation). Read that again. "Not a soul would be saved alive." Do you believe that? Bad question. It doesn't matter whether you believe it! It's a fact. World leaders have stated it. And we are proclaiming it! Such a realization should make man's blood run cold. You would think that he would cover his head in fearful shame and screechingly cry out to his God for immediate help. But man is too "sophisticated" for that sort of "nonsense." Man wants to survive all right. But it's got to be on his terms. Man must be in charge. Fine. That's his choice. We won't argue. God won't interfere. Quite yet! Man, enjoy yourself. Have all the "fun" you want. Play all your silly little games. You've still got a few more years to devise more misery and disaster. Go right ahead. Clutch vainly at the United Nations. Try "peaceful coexistence." Perhaps NATO or SEATO will be your savior? Maybe the Grand Design will work? Man, you've had it. It's almost over. All your futile efforts to save yourself are pitiful and pathetic. But man continues to shut his mind from the grim reality of impending doom. Like the little child who closes his eyes just before a rampaging automobile hits his dog, man bombards his senses and blanks his mind. But just as the little child must eventually open his eyes, man will soon be forced to see his own vile self and the incredible mess which he has labored so long to produce. Carnal-minded man can't stand to admit that he NEEDS God. He refuses to accept the cold fact that the way which "seems right" — HIS WAY — has failed! He blindly rejects Isaiah 59:8, "The way of peace they know not; and there is no judgment in their goings: they have made them crooked paths: whosoever goes therein shall not know peace." No, man doesn't think he needs God to show him the right way of life. He'll find it by himself. Give him a chance. Okay — how about 6,000 years? Long enough? Well it's about up — and the results are in. The tabulation is ridiculously easy to make. Man has recorded nearly 6,000 years of war after war and failure after failure. The ways of peace have strangely eluded him — like that big fish which got away. Who can doubt? The evidence is EVERYWHERE for all to see in the misery, poverty, sickness and wretchedness of this world. The daily newspapers scream it in bold print. The suffering BILLIONS plaintively verify it by their mournful looks and famished cries. Yet poor, blind, deceived man can't see or understand that HIS WAY HAS FLOPPED! Why can't man see the plain evidence of his failure? Because it doesn't suit him and he can't explain it. And whatever man can't explain he ignores. So the decline in morals, the increase in "Cold Wars," the shrinking food supplies and the rising world population are all nonchalantly overlooked. "Ignore it and it will go away" is the philosophy. "If it doesn't affect me, it can't be too bad." But such isn't the case. It is bad! And it does affect you. Ninety-nine out of every hundred of the people in underdeveloped countries will never, IN ALL THEIR LIVES, have what a North American family would consider a square meal. Children in Africa and India sit staring as if blind. Their arms and legs are like sticks of licorice. They neither laugh nor cry. They've degenerated just too far for any such displays of emotion — at two years of age they weigh only TEN POUNDS. Hard to believe — but true. Two-year-old children weighing the same as many a newborn baby. Imagine YOUR two-year-old child weighing only ten pounds! If your child were in such a condition, YOU WOULD BECOME INVOLVED QUICK! That probably doesn't mean very much to Mr. Well-off Citizen. It's too abstract. And anyway, he has to worry about his pressing problems. Which second car would look the most sporty to his associates? It's a nerve-racking decision. What about those thousands of children who starved to death on the very day that Mr. Well-off Citizen made this "critical" decision? Children? What children?" De Gaulle's plan didn't provide the answer. It was discarded along with De Gaulle. The "Great Society" created more questions than it answered. Where is the answer? Perhaps more aid for Vietnam? How about additional billions for space study or the war on poverty? What about more money lavished on the underdeveloped countries of the world? Sure, you name it — America gives it! But is money the answer? In the first place, the people of the underdeveloped nations don't even know how to utilize their gifts and spend their money! Often the rats eat as much of the donated wheat as do the people. Some people spend their foreign-aid money for marijuana — while the rain gushes through the roofs of their houses and between the cracks in their walls, soaking their poorly clothed families. Other people can be seen wearing expensive wristwatches and indulging themselves in hard liquor and still more unsavory pursuits — yet they don't have the necessity of a sheltered, private place to meet nature's needs. The mind-defying BILLIONS of dollars which we have poured into Vietnam haven't made the world more peaceful. But of course we can see some tangible results for our efforts: farms have been defoliated and villages have been burned out. This hasn't bettered the lot of the average Vietnamese citizen. Nor has it been appreciated. And then there's the inevitable Black Market. It flourishes in Saigon to the tune of hundreds of millions of dollars annually. And the pockets and bank accounts of a select few bulge — while the misery and wretchedness of the people abound. No, money isn't the answer! Yet man inflexibly stumbles on in the vain hope that the panacea for all his ills is, after all, just around the corner. Can the burgeoning idol of science produce any solution? Will success in space solve the problem of our food shortage on earth? Will more technology eliminate the difficulties which precipitate wars? Will GETTING AWAY from this earth be the "Open, Sesame" mankind needs to extricate himself from all his entanglements? Solomon knew the answer to these questions. "And further, by these, my son, be admonished: of making many books there is no end; and much study is a weariness of the flesh" (Eccl. 12:12). "For in much wisdom is much grief: and he that increases knowledge increases sorrow" (Eccl. 1:18). The fact that ninety percent of all scientists who have ever lived are alive today hasn't made the world happier. On the contrary, it is because of this vast increase in scientific knowledge that the very existence of man is in jeopardy! Today the whole earth lies paralyzed under the continued and increasing threat of nuclear devastation! Then take medicine. Not literally down your throat — but ponder the fact that in spite of the thousands of doctors and the multiplication of medical knowledge, the United States is one of the most unhealthy nations on earth! Furthermore, in spite of our thousands of philosophers, educators, and "do-gooders" — we have gigantic racial problems, which are getting worse. Knowledge properly used is a boon to mankind. Knowledge misused is a boomerang. Guess which one science has bestowed on us! Man's time is just about up. He won't be allowed to run from his problems much longer. He is going to have to learn to overcome them — ON THIS EARTH. That's the very thing he has been trying so hard to avoid. Man is going to have to candidly face his shortcomings, his inabilities, his faults and his sins. Nobody says it's going to be fun. But it'll pay off in a rich, abundant society for everybody. Man CANNOT do it alone. That's obvious. Real obvious. He needs help. He desperately needs help. Humanity's problems are NOT insoluble — but it will take some ONE far greater than puny man to prove that statement. This mixed-up world URGENTLY NEEDS God's Kingdom. Try telling that one to your friends. No, perhaps you better not — not unless you enjoy being ridiculed and scorned. And this itself proves the point — mankind won't recognize his own needs! He has been blinded. His eyes have been tightly sealed by the god of this world — Satan (II Cor. 4:4; Rev. 12:9). This society is so deceived that it won't even seek that way of life which would immediately yield abundance and happiness (John 10:10). If you were to ask the average citizen of India, Thailand, Japan, Israel or any of the other nations if they would like to see God's Kingdom come to earth now, they would look at you in dumbfounded astonishment. If they bothered to reply at all — which most wouldn't — the answer would be a resounding "No!" Everybody thinks his own personal way is best. The small nations and minority groups in the world — whether in Africa, Ireland or the USA — are imbued with the chant of "Give us freedom NOW!" They want to be freed from the laws and regulations which have kept peace and order in their lands. They want the right to riot when they want, to steal when they want, to kill when they want. They want the right to do as they please regardless of the cost to others. All want to be also freed from the laws of God which regulate and govern their lives. They, too, want the right to think, believe, do and teach exactly what they please in spite of its detrimental effect on others. Nobody wants God's way. Everybody wants his own way. Yet man's way — be it politics or religion or whatever — has not, is not and WILL NOT, ever, give him happiness or relief from his problems. Each person would be far better off far sooner if he would only desire God's Kingdom as fervently as he tries to justify his own miserable surroundings. Then we could all have REAL FREEDOM: freedom from hunger, freedom from poverty, freedom from sickness, and freedom from SIN and death. That's what God's Kingdom offers. What Is God's Kingdom Anyway? The religions of this world softly drool about the "Gospel of Jesus." But what they don't teach — and probably don't know — is that the "Gospel" is simply the advance news of the Kingdom of God. Christ preached it (Mark 1:14), the apostles preached it (Acts 20:25), and we preach it. Occasionally, the multitudinous religious denominations do mention the Kingdom of God. But neither Christ nor the apostles would ever recognize it. For good reason. Some say that "the Kingdom" is permanently located in heaven. Others say that "the Kingdom" will eventually be set up in the "hearts of men" once all mankind learns to work together in peace, harmony and good will. How long should we wait? Thank God not long! Because you won't find any of these "Kingdoms" in the Bible. All right, we know what the Kingdom of God isn't. Now what is it? In one sentence, the Kingdom of God is the Government of Almighty God ruling over the entire earth. It will indeed be on earth (Rev. 5:10; Prov. 10:30). Jesus Christ will be its King (Rev. 19:15-16). The entire human race — all nations — will be its citizens (Jer. 33:9). All men will finally learn to be at peace with one another and be fully obedient to God's laws (Micah 4:1-4). Its beginning is a thousand years (Rev. 20:3-5). And it shall then increase forever (Isaiah 9:7). When Christ returns to earth He will throw down every existing government (Rev. 19:15) and give His Kings and Priests (Rev. 5:10) — those begotten Christians who kept the faith and endured to the end (II Tim. 4:7-8; Rev. 2:26) — power over the nations to rule them with a rod of iron (Rev. 2:27). This is reality! And you're going to see it come to pass. For further information about the coming Kingdom of God, read our free booklets, Just What Do You Mean... Kingdom Of God? 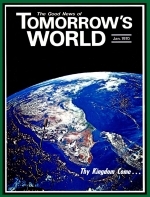 And The Wonderful World Tomorrow - What It Will Be Like. How Badly Do You Want God's Kingdom? You've already seen the mounting heap of depraved squalor called humanity. You've seen hapless human beings vainly try to eke out some remnant of a life. And you've also seen the Kingdom of God — the glorious solution to all man's problems. But does this concern you? Most people want to keep God at arm's length. He's nice to speculate about so long as He is kept entirely out of your own personal life. Give yourself a little test. Be sincere with yourself. Nobody's looking. Search deep into your own heart, beyond that semi-shaded area of self-deception of which Jeremiah 17:9 speaks. Now, just how earnestly do you desire to see God's Kingdom here on earth? Be honest. How willing are you to give up everything you have — RIGHT NOW — in order for God's Kingdom to be here? Are there certain things you'd like to do FIRST? Would you younger people like to "live" a little more first? Would you rather get married, have your family and enjoy your life to the full — FIRST? How about some of you more mature people? Do you longingly yearn to see God's Way of life instituted here on earth so that-all human heartache can be eradicated? Or do you sometimes wish that you could have more time to prove that you too can be a great success in life? Young and old alike, wouldn't you almost RESENT Jesus Christ interfering with your life by returning to earth? Wouldn't you feel deprived of something good — almost cheated — if this society were destroyed. You would like to indulge yourself and experience "life." We all would. But be circumspect (Ex. 23:13 and Eph. 5:15). Look around you. Is what you see good? Obviously not. Then why would anyone want to hang on to it? Those of you who really love this world will not love its ways or systems, but will care for its people — just as Jesus did. You will be earnestly looking forward to the return of Jesus Christ and His establishing of THE GOOD WAY OF LIFE FOR ALL MANKIND. We have seen that Jesus Christ, our elder brother in God's Family, admonishes us to pray zealously "Thy Kingdom come." It should usually be our very first request to God the Father immediately after opening our prayer by hallowing His Holy Name (Matt. 6:9-10). But how do we pray "Thy Kingdom come"? Do we mumble and repeat those three words over and over again with sanctimonious rhythms and with tremulous modulations? Obviously not, but it's crucial for our personal salvation that we learn! First of all, we must comprehend what the words "Thy Kingdom come" literally mean. So we paraphrase it into modern English: "I fervently desire, with my whole being, the return of Jesus Christ and the establishment of the Government of God on this earth." To entirely grasp the significance of these concepts, we must experience true compassion because of all the abominations which are presently destroying our brothers on this planet (Ezra 9:4). Our world is utterly wretched, its people are miserable and doleful, and we MUST care! So what if we "care"? What can we do? Simple. Yet incomprehensibly fantastic. We can — no, we must —beseech God to intervene in world affairs and straighten mankind out. Will the Great God of Heaven and Earth listen to our feeble requests and speed His return? The Apostle James was inspired to write that "the effectual fervent prayer of a righteous man availeth much" (James 5:16). Now read Rev. 8:3-4. The prayers of the saints fill God's Royal Throne Room! And immediately thereafter, as a direct result of these prayers, God intervenes in world affairs by pouring out His seven trumpet plagues (Rev. 8:6 to 11:15). These supernatural disasters culminate in the return of our Savior and His conquering subjugation of the kingdoms of this world, transforming them into "the Kingdoms of our Lord and of His Christ: and he shall reign for ever and ever" (Rev. 11:15). Do you realize what that means? Can you see your enormous responsibility? Don't just skim over these words as you pleasantly nod your head. This is reality! You ARE INVOLVED IN THE SALVATION OF HUMANITY! God is watching your personal reaction — right at this moment. That's not some religious scare-talk. It's a fact. This article is being read by the most select group in human history. Nothing is more important. Because God must first give this world His powerful warning message — a witness so plain that it will be permanently imprinted in all human minds — only then will the end come (Matt. 24:14). God's worldwide witness must be completed before He intercedes to save man from himself. God's Work must precede God's Kingdom. That's God's plan: the witness, man's near self-destruction, the Kingdom — in that inviolate order. GOD'S WORK is preaching and publishing the critical warning witness today (Matt. 24:14; Mark 13:10). That means you. You are part of God's Work. After this mammoth task is accomplished, then and only then, will God finally bring His Kingdom to earth. So when you pray "Thy Kingdom come," you must at the same time be wholeheartedly dedicated to God's Work! How do you prove your sincere devotion to God's Work? Read on. Recognize that you are involved. Realize that God has already called you. The fact that your eyes are reading these words is absolute proof that you are an integral part of God's Work — as incredible as that may sound. This is the very Work of God! And you're in it. But the question is: How will you respond? Even God doesn't know. He's anxiously awaiting your decision! Will your Creator be able to use you? Or will He be forced to call someone else to take your place? You have been offered an awesomely stunning opportunity to participate in God's Work and to help save this world. And, as a bonus for your selfless humanitarianism, God will give you the gift of Eternal Life and the exalted position of a Ruling Son in His Royal Family. But there are responsibilities. Here's what you must do! You must be totally engrossed in God's Work! That means enthusiastically devoting much of your prayers to God's Work. As many thousands of TOMORROW'S WORLD subscribers who are Co-Workers with Christ in this great Work realize, it also means cheerfully sending God's tithes and offerings to His Work! No one who selfishly prays about himself all the time and no one who covetously lavishes all of his money on himself will ever gain eternal life. Your personal salvation is directly related to how immersed you become in the Work of Almighty God. The more we all throw ourselves into God's Work — as a vibrantly united TEAM — the sooner God will fulfill His warning witness in the world today and the faster He can bring His Government — the Kingdom of God — to all mankind in the World Tomorrow. And finally, we look forward to the time when the whole world will thankfully pray in unison "Thy Kingdom CAME!"